I’ve had exactly two moments of interacting with book-goers while being an author. One was at my own signing at a local coffee house. The other was at the South Dakota Book Festival a couple of weeks ago. When I thought of it, initially, I was more than a little nervous. As far as extroverted people go, I am not one that falls delicately into that category. In a typical setting, I’ll be the one listening to your conversation, taking in the scene, contemplating what I want to watch on Netflix when I get home and into my comfy pants. …despite all the red arrows and squigglies surrounding me. People love free candy, hell, free anything. Whatever draws their attention to take another second before passing you. If they pause enough to look at your book cover(s), they might pick it up and read the back or better yet, ask you what your book is about. Table decor helps draw attention from further away. I met some great people at the Book Festival. 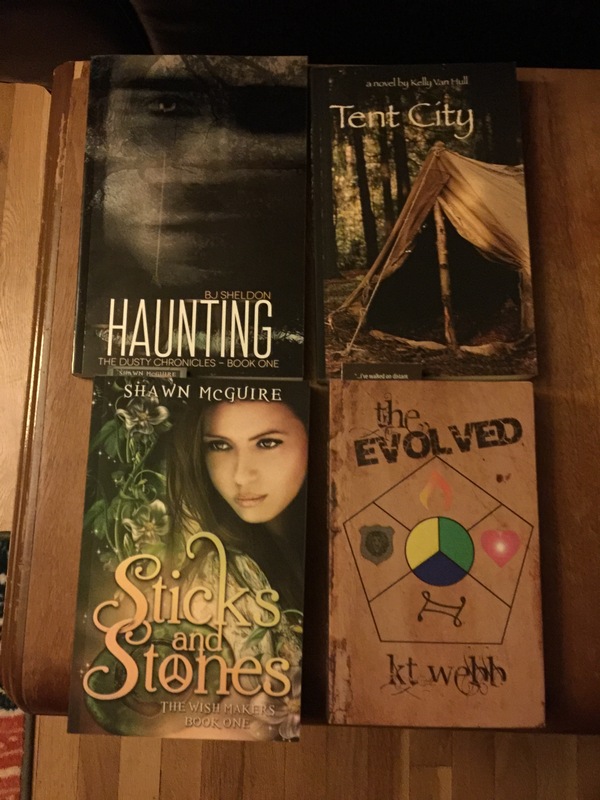 Four new author friends and an editor. 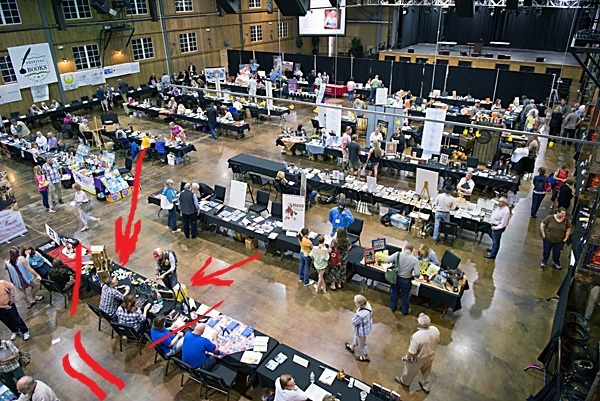 Given how small of a venue I was at, I was happy to know there was another RC author in my similar Indie World! I listed some of my take-homes from my new author friends who (coincidentally) I’ll get to see at Utopia in Nashville this June! Click on a pic to learn more! Proof,… see? I got my own! It’s that time, ladies and gents! Approach the center of the ring for your instructions. Now, fighters, this is all of our first official fights. Remember to start prompting your fans on when to vote for you and the working title of your story. On Fight Day, only your title will be displayed. This way, the casual reader will have an opinion motivated solely by the title and the work itself. Your training is done as of September 20th. After that time, get your stories to me so I can look them over and set them up for Fight Day. NO EDITS will be done by me, only copying and pasting, so train well. The story must center around REVENGE. The lengths, extent or interpretation of that word is solely up to the writer/fighter. This is an update of sorts as well as a reflection and a promotion for upcoming things. Proofreading is complete. Formatting should be set up and underway within the week. That means my first Manuscript will be available this month… Breath that in…hold it, THIS MONTH!! When I was first deciding in my teenage years that I wanted to become a writer, I really didn’t think it would take this long. The majority, if not entirety, of that time was me self-doubting, shuffling my feet, and expecting a sign from the heavens that I was doing the right thing. After realizing it was me or nothing, now or never, I started along this path last fall. My first book complete, I submitted to agents in hopes that it would immediately get snatched up. A couple dozen attempts later and the air left my balloon of hope deflated. Then, I just started writing. I wrote things on my mind and started a story just for something to clear my head. BOOM! A Time to Reap stepped forward and told me this is supposed to be fun. Thus my road to becoming an Indie author occurred. From February until now it felt like a graduation I was prepared for. I went through the motions, perfected and tweaked my words and immersed myself in a pool with like writers. Now, the day to walk the stage approaches and I hope I have friends, family and fans getting ready to cheer as I make the journey. The 1,000 miles is rounding marker 999 and my stomach tingles with excitement…and a little trepidation. If anyone read yesterday’s passage, you may have seen the idea for a Writer’s Project this fall. Write Club Fight Club has a page up already and fighters have already started emailing me. If you are interested, please check out the site, email the address listed there and see if you want to train and get in the ring. It is seriously all about fun and I’m excited to see how it goes! Please come on over and join or follow along. Tell your friends. I’m planning on inviting Neil Gaiman and Joe Hill via Twitter. I somewhat doubt they have the free time or want to participate, but hell, no risk – no reward. I am certain we have all seen or been tempted by the idea of a collaboration with another writer for ideas or expansion into another genre beyond our wheelhouse. This is not a collaboration. This is combat. Literary speaking combat. I am looking to those out there that may have interest in being part of a club. We will choose a topic/theme/genre or word and two authors will “battle” by writing a short story or teaser roughly 1500 – 3000 words in length. Fans, readers and participants can vote on which story prevails. Think of it as Epic Rap Battles meets Poetry Slam meets Fight Club with a pinch of Thunderdome in there. The Club will not start until October 1, but I want to get a potential list going by early September to start pairing writers up against one another (and yes, I will have my hat in the ring as well). I want to find at least 10 interested writers (I have already heard interest from 2 before I started this post) and can take up to 20 initially. Depending on the Club size, we will post a battle weekly if not semi-weekly. We will try to implement a bracket once things start rolling. Each work is not going to be published, will maintain basic copyright laws and is mainly for fun and to get your work/name rotating out there. All writers are welcome to apply, whether you’re published, unpublished, Indie, poets, bloggers or the occasional writer. Time commitment is up to you, but if it’s your first time, you’ll have to write. Simply email Write.Club@outlook.com with a link to your work, or a portion of your writing (I won’t open attachments, sorry). Now…Share, Share, Share! Get the word out to everyone. Consider authors to be like meals. They are meant to nourish and feed a reader’s imagination. Variations of authors range from the fancy etiquette of classical and modern day literature to the drive through garbage meant to provide a taste and little more than that. I offer up that as well as literary authors, we should not forget the other artists who use their words to feed our souls. Musicians, poets and yes, even public speakers.As writers, we all try to tie in a story with emotions. Musicians and their ilk do the same thing in a much more compacted version lasting only about five minutes. It’d be the equivalent of some sort of Jetson’s meal in a pill. Not everyone’s pallet is the same, so don’t go asking why one person won’t eat your sauerkraut dish when they have a distaste for cabbage of any kind. So, test your dishes out and feed the world. Those who are hungry enough will feed off of your words. The paper. Get it on the paper. It’s NaNoWriMo time and for all of you that have that great classic novel that you’ve been waiting to get onto paper, this is your month. Procrastination will take you no further. In this month you are to set the goal to write 50,000 words before December 1st. This does not include emails, blogging or other dictation. 50,000 free-spirited words towards creativity. Now, please don’t think of this as the New Year’s Day of Writing. Like most resolutions, the first week leads to a self-discovery of improbabilities and all is forgotten in the Winter’s wind. Don’t let holidays or this or that take away a lofty, but important goal for all writers. I will plan to end each blog at the bottom with my Word Count to date, to keep me honest.